With more than 25 years in music that have seen him evolve from a thrashing “cowpunk” rocker to an alt-country bard, singer-songwriter Alejandro Escovedo has certainly watched some great songs pour out of his pen. His new record, “A Man Under The Influence,” is the ultimate example. It’s teeming with slow-burning songs of emotion that create snapshots of a man weaving the eclectic elements of his life into his art. According to the Austin, Texas-based Escovedo, this album — his first studio work in six years — takes from both his previous work and personal experiences, constructing what is his best record yet. “I knew that I wanted to make a record that was a combination of a lot of things I had done in the past,” he said. With a career that started in 1975 in California, Escovedo has traveled through several seminal roots-rock outfits — The Nuns, Rank and File, The True Believers and Buick MacKane — before blazing a solo career in the early ’90s. His first solo albums had him dabbling with string quartets as well as acoustic guitars. His last album, 1999’s “Bourbonitis Blues,” was a combination of originals and cover songs sometimes backed with a full orchestra. His ’90s solo output was enough for alt-country tome, No Depression magazine, to name him “Artist of The Decade.” No one seemed to mind the fact that he occasionally worked in a Stooges cover or tried out a Velvet Underground song both on stage and on his records. “A Man Under The Influence” is a record of nocturnal beauty. Slightly spooky, it’s an intense meditation on love, regret, family life and music-making — with people more often going than coming. The first song, “Wave,” slides in from the silence with sparse percussion, the determined strum of a guitar and Escovedo’s plaintive voice singing about some kind of diaspora. The song has an otherworldy feel at times with lines like “Don’t you cry/I made it to the other side,” and the quiet howl of feedback and humming strings. The tender “Rosalie” is a love letter backed by whimpering steel guitar. The song contains a lyrical nod to “Amazing Grace” and a few songwriting cliches (“There’s an ocean between us my love”), but he often follows with an inventive line (“An ocean of powder and dust”) and there’s a sincerity that makes it convincing. The album’s first two tracks, “Wave” and “Rosalie,” were both used in a play, “By The Hand of the Father,” that premiered in Los Angeles earlier this year. The play follows the lives and times of Mexicans in the U.S. in the early part of the 20th century. Escovedo has said that he drew inspiration from both his family — he is one of 12 children of a Mexico-born former mariachi musician — and his personal life for both songs. “Wave” was written before the play, but “Rosalie” was composed by taking elements from the play and his own life. “Even though it deals with this young couple that writes letters to each other every day for seven years, it corresponds to something that was happening in my life,” he said. However, the process was not without its challenges. As many of the songs on the album were written from a first-person perspective, any song could be construed as a personal confession. It is an assumption that Escovedo says he doesn’t mind. In a different type of personal strife, the song “Rhapsody” sounds like a songwriter’s blues, someone wrestling with an ungenerous Muse. The melody is a mesh of shimmering chords, acoustic guitar plucking and whispering pedal steel guitar. Oddly, the chorus, “So if the melody escapes me/I will stumble upon it soon/If it’s not a rhapsody/The memory will have to do,” is the album’s best hook. “Castanets” is an uptempo change of pace (without losing intensity). Kickstarted with a ’50s guitar riff and a modified Buddy Holly beat, this rocker and its frenzied guitar breaks are the record’s lone brush with aggression. Lyrically, it might be about lusting after a woman and yet knowing it’s probably better to keep your distance. “Follow You Down” displays Escovedo’s vocal prowess. His voice is bright and is very reminiscent of Elvis Costello but without the barroom wail. The lush track also contains the most exquisite yet melancholic string passages. As the record progresses, the use of strings (violin, cello, bass) moves from the shadows into the foreground. The strings change personality with each song — they’re a humming haze throughout the ornate “Wedding Day” and a weeping plea in “As I Fall” (which features backing vocals from ex-Whiskeytown frontman Ryan Adams). Although Escovedo said that he feels like he follows in a Texas songwriting tradition mapped out by Townes Van Zandt, Willie Nelson, Lucinda Williams and others, it’s his use of strings that makes his music distinctive. Escovedo said that his divergent experiences both musically — from the Texas songsmiths to the Velvets — and personally, have molded his music. This new album, better than previous attempts, is the perfect reflection of this, with the title conveying that feeling. 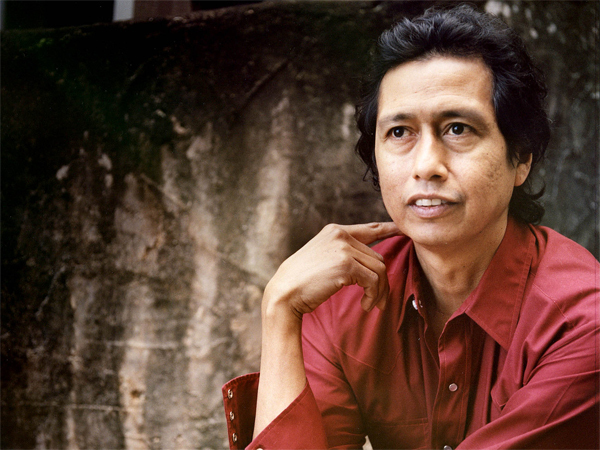 Tags: "A Man Under The Influence", Alejandro Escovedo, interview. Bookmark the permalink.